Given that we are rapidly approaching the summer months and the short dark days of winter are behind us again, I think it's appropriate to feature the Sunshine pleco this month. 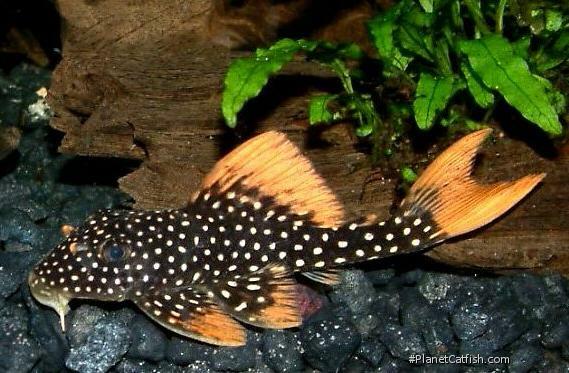 Also know as the Goldie Pleco, this species has been available for nearly two decades to aquarists and was amongst the first L-numbers to be assigned. Before it was officially scientifically described in 1994 this fish was given an L-number of L14 in the March 1989 issue of the German DATZ magazine. The originating point of all L-numbers. This is a good case in point for the existence of L-numbers. While L014 is "retired" in a sense it served a purpose for 5 years - most L-numbers still apply to unidentified or undescribed species and as such are still useful. That said, they are essentially standardized common names. Rather than further discuss the pros and cons of the L-numbering concept, let's look at the fish itself. These fish are most commonly offered for sale as juveniles around the 2" size - sometimes a little larger. Personally I have seen a few shipments of everything from fish this size up to full grown adults. Adult fish are over 10" long and it's only really when you see the stages of their colour development that you appreciate that they are the same species as the juveniles. To the left here is an image of several adults in a holding tank. Notice that the vivid orange colouration in the fishes fins fades to the tips of the fins and becomes more yellowy. This fish retain it's yellowy-white suckermouth, a feature which distinguishes it from many "black with white spots" plecos. With age the fish develops many more spots which spread over the fins. The beautiful nasal flutes also fade from orange glory with age. Perhaps the adults should be called twilight plecos! This isn't really a good description as the adult fish are very striking and their medium size makes them a perfect show fish for a medium sized aquarium. The Sunshine pleco is quick growing (for a pleco), a fact which belies it's good adult size and eagerness to eat. I have not heard of any problems feeding this fish, it adapts to anything offered. The fish is as happy eating meaty foods as it is munching on melon rind as depicted here. Overall however maximum growth can be achieved by biasing the foods offered to the meaty food stuffs. Beautiful colouration aside this species puts me most in mind of the hardy common plecos. They eat anything, grow to a good size and look after themselves without being too aggressive. Aggression can be minimized by supplying this fish with several hiding places located around a central feeding place. If other similarly natured plecos are present then there will be the usual minor skirmishes, but nothing untoward. Small fishes are ignored but, being a true opportunist, very sick or near death fish will be eaten if the pleco can trap them in an enclosed space. Many a pleco has been blamed for this demise or that, but it is only that they are first to seize the "opportunity" of some fresh food. My thanks to Shane Linder for much of the information contained within this article. Type Locality Ilha da Fazenda, Rio Xingu, Pará, Brazil. Etymology (Latin)Scobis=Sawdust + (Greek)agkistron=hook. aureatus = golden; alluding to the golden finnage. Identification Striking sub-adult colouration which diminishes in adults which are still quite distinctive. Commonly known as the Goldie or Sunshine pleco, this ultimately larger fish is a frequent import. Furniture Sandy or small pea-shaped gravel with groups of rounded stones and few or no plants best reproduces this fishes natural habitat. If keeping with similarly sized plecos, arrange the aquarium to ensure there are plenty of hiding places and multiple feeding areas to diffuse feeding time ''focus''. Compatibility A robust pleco suited for most environments, the only catch being the heat. Suggested Tankmates Suitable as a discus or angelfish tank pleco. Also OK with South American cichlids - a good way to brighten up any oscar tank - but might not do well with Central American cichlids due to their slightly lower temperature requirements. Perfect with rainbowfish if you don't mind breaking the biotope mould. Breeding Has been bred in captivity. Match. Aqualog L014a is a juvenile. There are 217 registered keepers, view all "my cats" data.